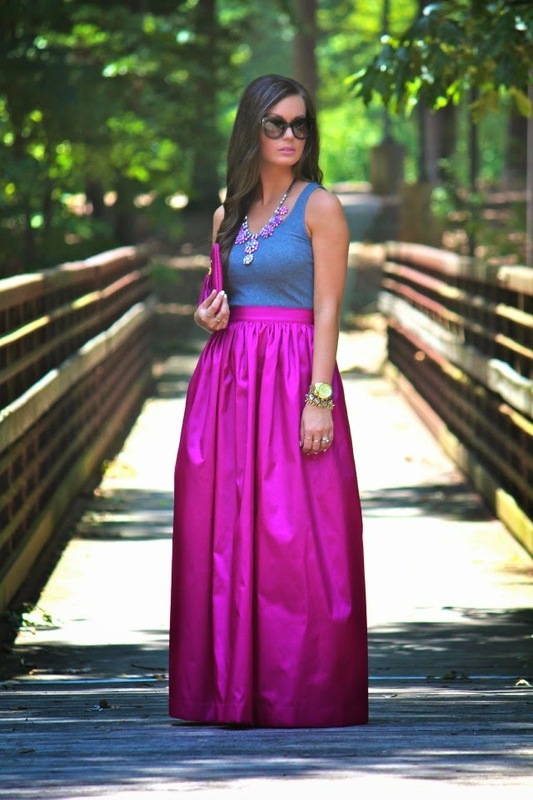 What girl doesn't love a good maxi skirt? The fun part about this adorable fuschia skirt, is not only the color but I love how easily it pairs with just a casual tank. It just seemed appropriate to throw on a statement necklace and head downtown to dinner. Simply love this look- you styled this so well! The color of this skirt is fantastic! This color would work great all year round. Beautiful. You look gorgeous! That skirt is amazing! This is one of my favorite looks of yours! That skirt is so pretty and you styled it perfectly! Love it! This is gorgeous! I absolutely love a dressy skirt paired with a relaxed top! Plus, the jewels really top off the look! That skirt is phenomenal!! Gorgeous! I love this statement skirt - so bold and lovely! That skirt is absolutely stunning!!! Love the color. The color on the skirt is fabulous! what a beautiful skirt!!! really love how you dress casual and dressy together! Stop! This skirt is gorgeous!! I love this skirt, the color and style is amazing! This is my definition of a perfect look!! Just flawless. That skirt is everything of good, and you've definitely made it perfect with that simple top.